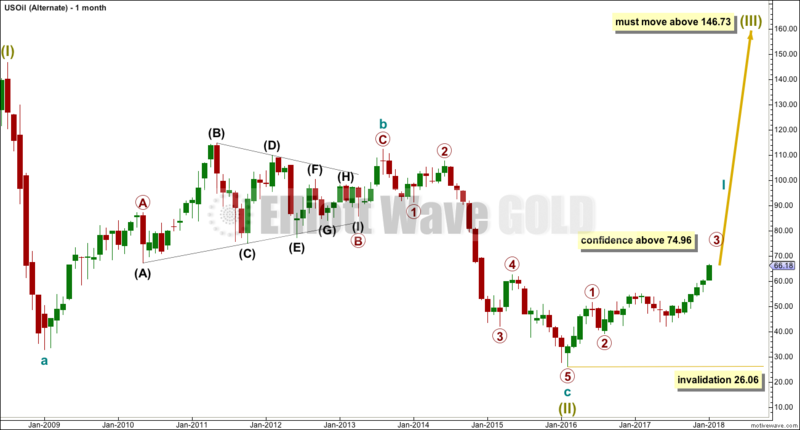 This week the Gold analysis will be available only to members of Elliott Wave Gold. However, if this weekly offering is to become a regular paid subscription service, then Gold would always be a part of it. Summary: The trend is up and strong. Corrections are an opportunity to join the trend. Divergence between price and the AD line for Friday’s high is bearish and suggests a correction may come sooner than expected. The next target is now at 2,896 for a very short term interruption to the trend (it may be over within a day), and the target after that is at 2,951 for another short term interruption to the trend (it may be over within a week). This looks like a third wave that is still incomplete. It may have just passed the middle strongest portion, so look for volatility to increase as a series of fourth waves unfold. The large expanded flat labelled Super Cycle wave (IV) completed a 8.5 year correction. Thereafter, the bull market continues for Super Cycle wave (V). The structure of Super Cycle wave (V) is incomplete. At this stage, it is subdividing as an impulse. There is no Fibonacci ratio between cycle waves I and III within Super Cycle wave (V). This makes it more likely that cycle wave V will exhibit a Fibonacci ratio to either of cycle waves I or III. Cycle wave V has passed equality in length with cycle wave I. The next two Fibonacci ratios in the sequence are used for two possible targets for it to end. The teal channel is drawn using Elliott’s first technique about an impulse. Draw the first trend line from the ends of cycle waves I to III (from the months of July 2011 to December 2014), then place a parallel copy on the low of cycle wave II. Cycle wave IV has found support very close to the lower edge of this channel, so the channel looks about right. The lower edge should continue to provide support, and the upper edge may provide resistance if price gets up that high. Copy this large channel over to weekly and daily charts, all on a semi log scale. The lower edge will be important. 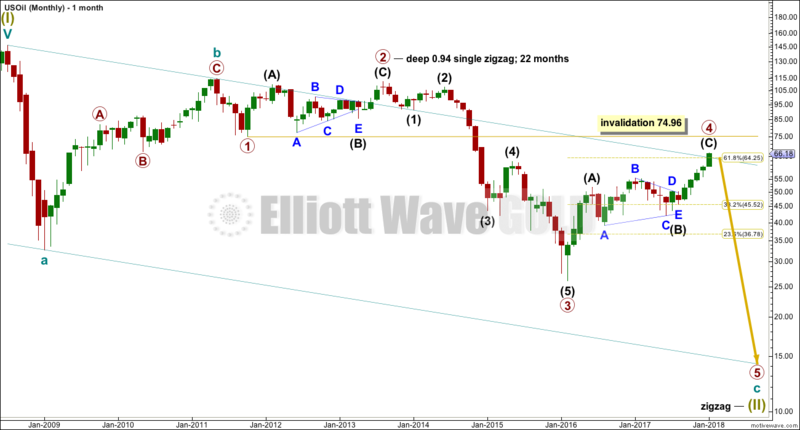 Cycle wave II was a shallow 0.41 zigzag lasting three months. Cycle wave IV is now seen as a more shallow 0.28 double combination lasting 14 months. 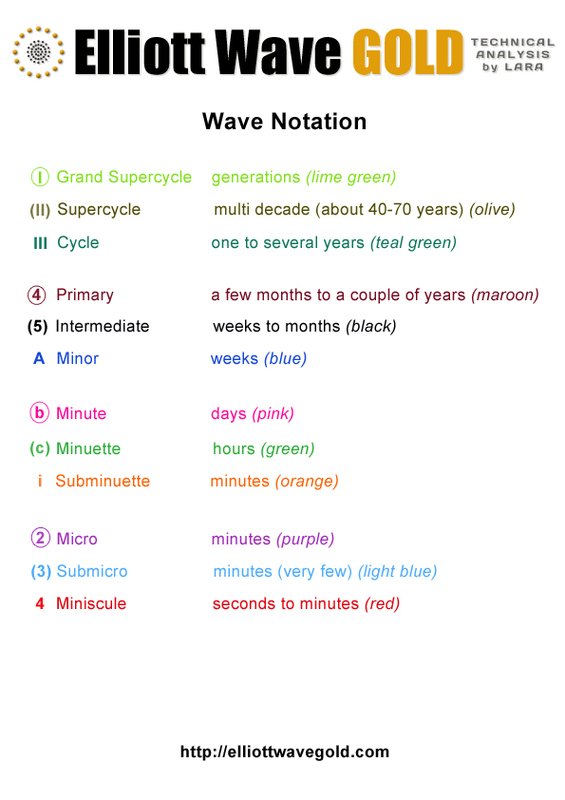 With cycle wave IV nearly five times the duration of cycle wave II, it should be over there. Cycle wave I lasted 28 months (not a Fibonacci number), cycle wave II lasted a Fibonacci 3 months, cycle wave III lasted 38 months (not a Fibonacci number), and cycle wave IV lasted 14 months (one more than a Fibonacci 13). Cycle wave V has begun its 23rd month. The structure needs several more months to complete. It may last another 11 months to total a Fibonacci 34, but that may not be long enough. The next Fibonacci number in the sequence is 55, which would see it continue from now for another 32 months, just under three years. That looks entirely possible. It is also possible that cycle wave V may not exhibit a Fibonacci duration. 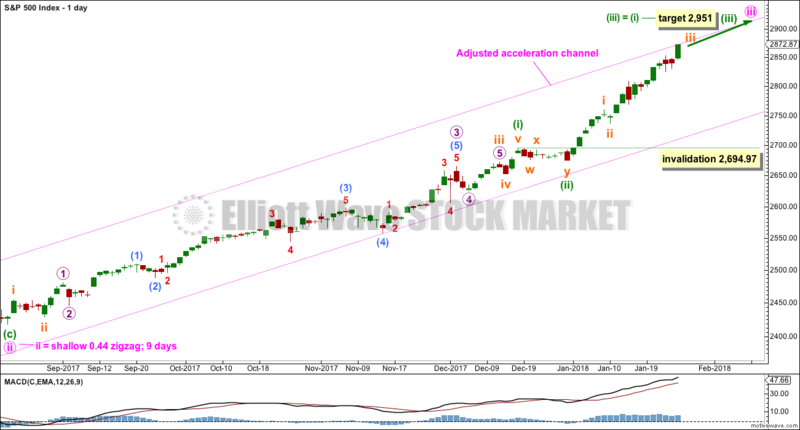 Within cycle wave V, the upcoming correction for intermediate wave (4) may not move back down into intermediate wave (1) price territory below 2,193.81. Within cycle wave V, the corrections for primary wave 2 and intermediate wave (2) both show up clearly, both lasting several weeks. 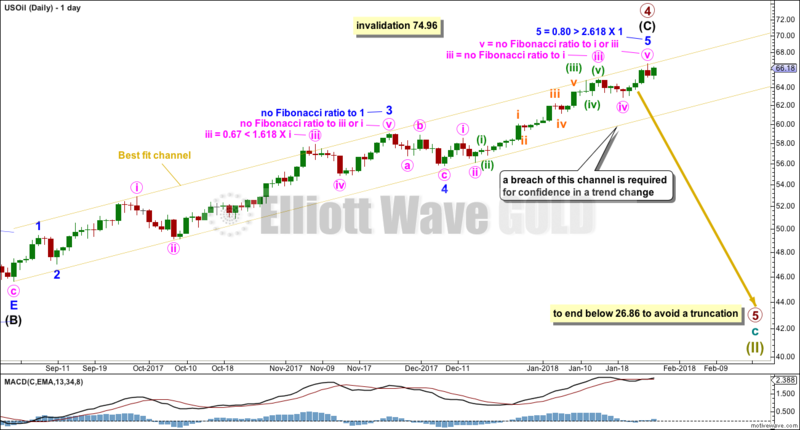 The respective corrections for intermediate wave (4) and primary wave 4 should also last several weeks, so that they show up at weekly and monthly time frames. The right proportions between second and fourth wave corrections give a wave count the right look. This wave count expects to see two large multi week corrections coming up. Cycle wave V has passed equality in length with cycle wave I, which would be the most common Fibonacci ratio for it to have exhibited. The next most common Fibonacci ratio would be 1.618 the length of cycle wave I. This target at 2,926 now looks too low. The next most common Fibonacci ratio would be 2.618 the length of cycle wave I at 3,616. 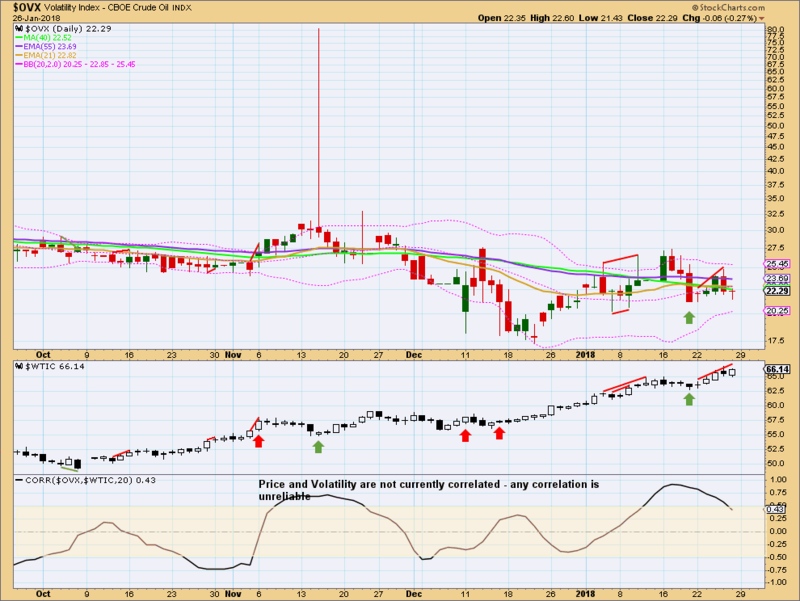 This higher target is looking more likely at this stage. Intermediate wave (3) has passed all of equality in length with intermediate wave (1), and 1.618 and 2.618 the length of intermediate wave (1). It is possible that intermediate wave (3) may not exhibit a Fibonacci ratio to intermediate wave (1). The target calculation for intermediate wave (3) to end may have to be done at minor degree; when minor waves 3 and 4 are complete, then a target may be calculated for intermediate wave (3) to end. That cannot be done yet. 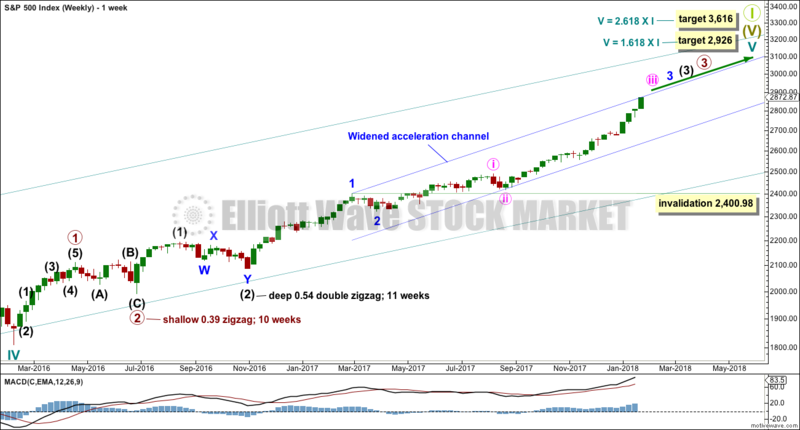 When minor wave 3 is complete, then the following multi week correction for minor wave 4 may not move into minor wave 1 price territory below 2,400.98. Minor wave 4 should last about four weeks to be in proportion to minor wave 2. It may last about a Fibonacci three, five or even eight weeks if it is a time consuming sideways correction like a triangle or combination. 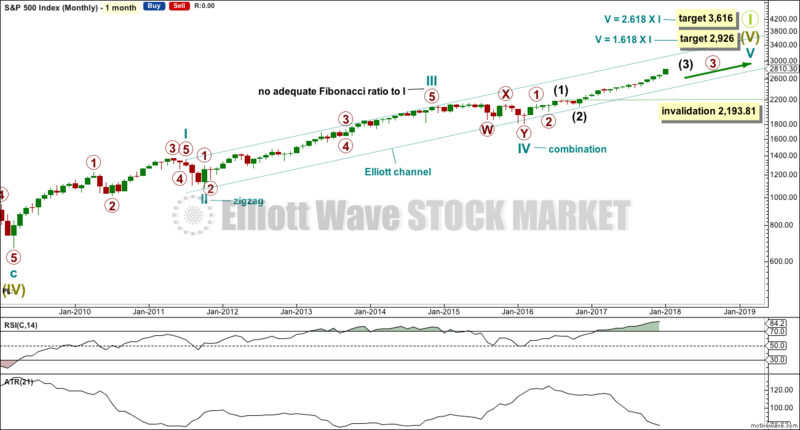 An Elliott channel may be drawn about the impulse of intermediate wave (3) when minor wave 3 is complete, and minor wave 4 may end about the lower edge of that channel. At this stage, a widened acceleration channel is drawn now in blue about the impulse of intermediate wave (3). This is drawn in the same way as an Elliott channel using Elliott’s first technique. A third wave up at four degrees may be completing. This should be expected to show some internal strength and extreme indicators, which is exactly what is happening. Members are advised to review the prior example given of a cycle degree fifth wave here. 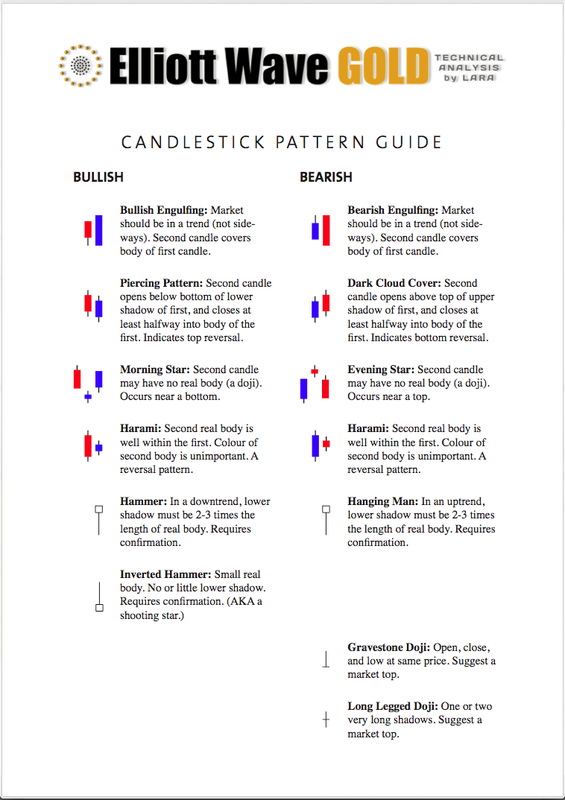 The purpose of publishing this example is to illustrate how indicators may remain extreme and overbought for long periods of time when this market has a strong bullish trend. If the current wave count is correct, then the equivalent point to this historic example would be towards the end of the section delineated by the dates November 1994 to May 1996. In other words, the upwards trend for this fifth wave may only have recently passed half way and there may be a very long way up to go yet. Keep redrawing the acceleration channel as price continues higher: draw the first line from the end of minute wave i to the last high, then place a parallel copy lower down to contain all this upwards movement. When minute wave iii is complete, this would be an adjusted Elliott channel and the lower edge may provide support for minute wave iv. The focus for the short term will be on identifying the next multi week interruption to the upwards trend. 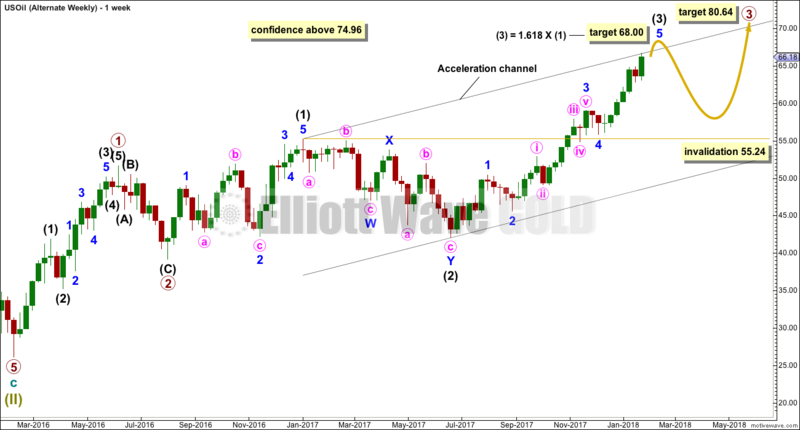 A target for minuette wave (iii) fits only with the second higher target on the weekly chart. Minuette wave (ii) subdivides as a combination and lasted only eight sessions, about only one and a half weeks. Minuette wave (iv) may be a zigzag, which tend to be quicker structures than combinations; a Fibonacci five days will be the first expectation, but it may be over within less than one week. Because minuette wave (i) was a long extension, minuette wave (iii) may be shorter or only about equal in length. If minuette wave (iii) is about equal in length with minuette wave (i), then they would both be long extensions. Only two actionary waves within an impulse may be extended. If both minuette waves (i) and (iii) are extended, then minuette wave (v) may not extend. Minuette wave (iv), when it arrives, may not move into minuette wave (i) price territory below 2,694.97. This upwards trend is extreme and stretched, but there is still no evidence of weakness at the weekly time frame. There is no divergence to indicate any weakness yet between price and RSI. As a third wave at multiple degrees comes to an end, it would be reasonable to see indicators at extreme levels. A correction will come, but it looks like it may not be here yet. There is still no reasonable divergence to indicate weakness. 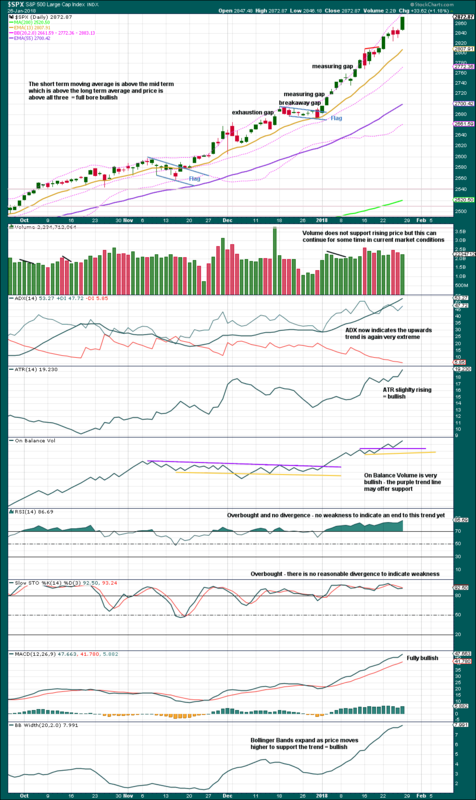 This trend is extreme and overbought, but that can remain for long periods of time when this market has a strong bullish trend. 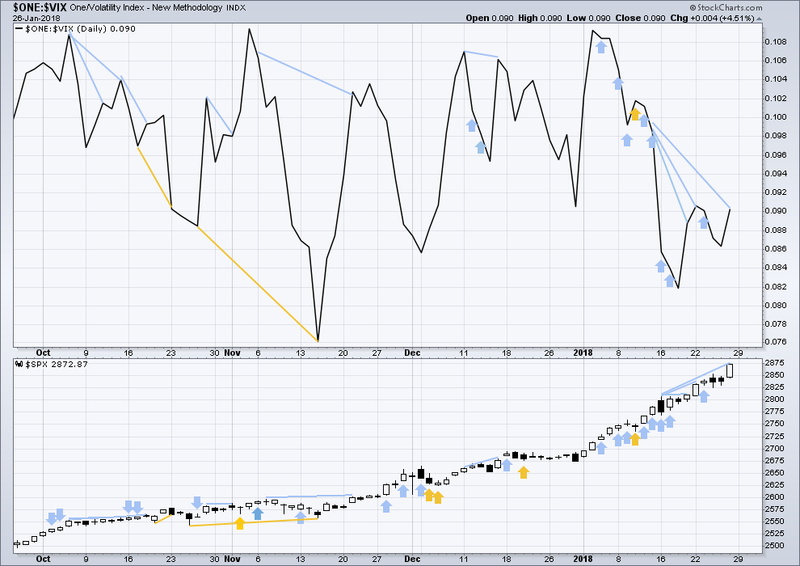 There is still strong short term divergence between price and inverted VIX. The new high in price has not come with a normal corresponding decline in market volatility. This is bearish. However, this bearish divergence so far of late has failed to result in any reasonable downwards movement from price. It may be an early warning sign, but it does not appear at this time to be a useful timing tool. All of small, mid and large caps last week made new all time highs. 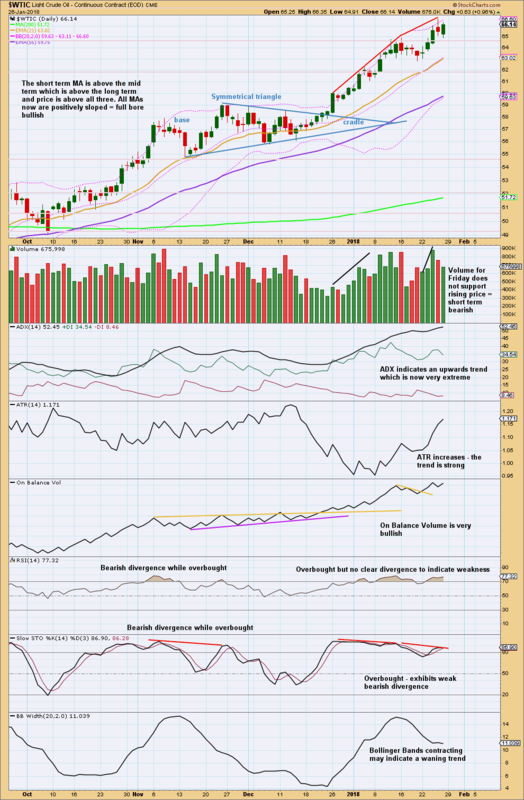 This market has good support from rising breadth. The new high in price on Friday is not matched by a new corresponding new high in market breadth. This divergence is bearish and indicates weakness in price, but it is not very strong. 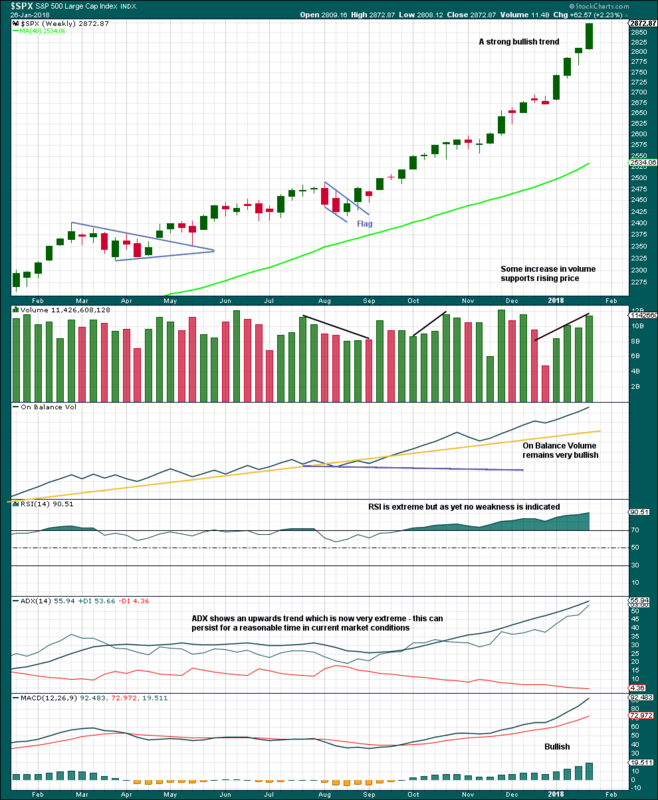 The S&P500, DJIA and Nasdaq this week made new all time highs. Only DJT did not make a new all time high and has moved lower. This divergence is slightly bearish; DJT may be leading by beginning a correction first. Summary: Assume the upwards trend remains intact while price remains within the yellow channel on the daily chart. Only if that channel is breached by downwards movement should a high be assumed to be in place. A new high now above 74.96 would provide a strong indication that Oil may be in a long term bull market. The target would be at 80.64, but a large correction for a big fourth wave would be expected prior to the target being reached. Price this week has closed above the teal resistance line, the upper edge of this very wide channel. This wave count expected it would be fairly likely that primary wave 4 should have found resistance there. Because this line is now breached on the daily chart a new alternate is considered below. Primary wave 4 subdivides as a zigzag, and within it intermediate wave (C) may now be complete. A new target is calculated for primary wave 5 to exhibit the most common Fibonacci ratio to primary wave 1. 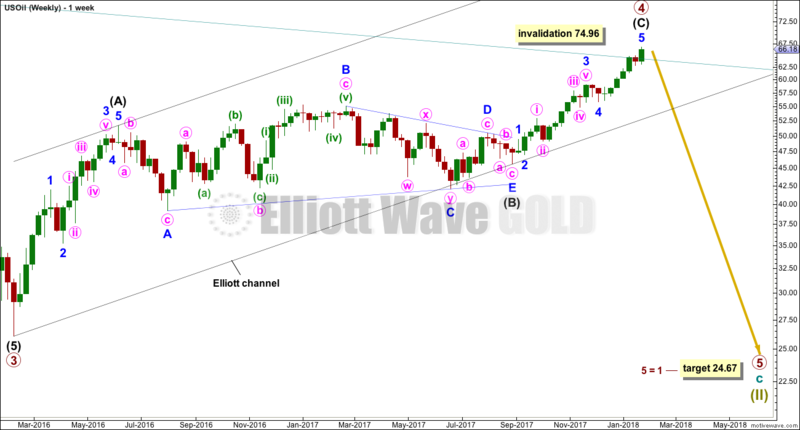 An Elliott channel is added to this possible zigzag for primary wave 4. A breach of the lower edge of this channel would provide a very strong indication that primary wave 4 should be over and primary wave 5 should be underway. Intermediate wave (C) may now be complete at all degrees. However, the yellow best fit channel must absolutely be breached by downwards movement before any confidence that a high is in place may be had. Assume the trend remains the same, upwards, while price remains within the channel. This wave count is at the point now where it requires channel confirmation. If primary wave 4 continues any higher, it may not move into primary wave 1 price territory above 74.96. Cycle wave b is seen as a zigzag, and within it primary wave B is seen as a running contracting triangle. These are fairly common structures. Primary wave 3 may only subdivide as an impulse, and within it intermediate wave (3) may be incomplete. The target assumes the most common Fibonacci ratio to intermediate wave (1). Intermediate wave (4) may not move into intermediate wave (1) price territory below 55.24. Price is currently rising on declining volume at this time frame. However, the incomplete month of January is now stronger than the month prior. Volume now offers some support to rising price at least for the short term. Friday’s session moved price lower with a lower low and a lower high, but the candlestick closed green and the balance of volume during the session was upwards. Volume shows a decline, and so the very short term volume profile is interpreted as bearish. There is not enough divergence with price and RSI to indicate an end to this trend here. 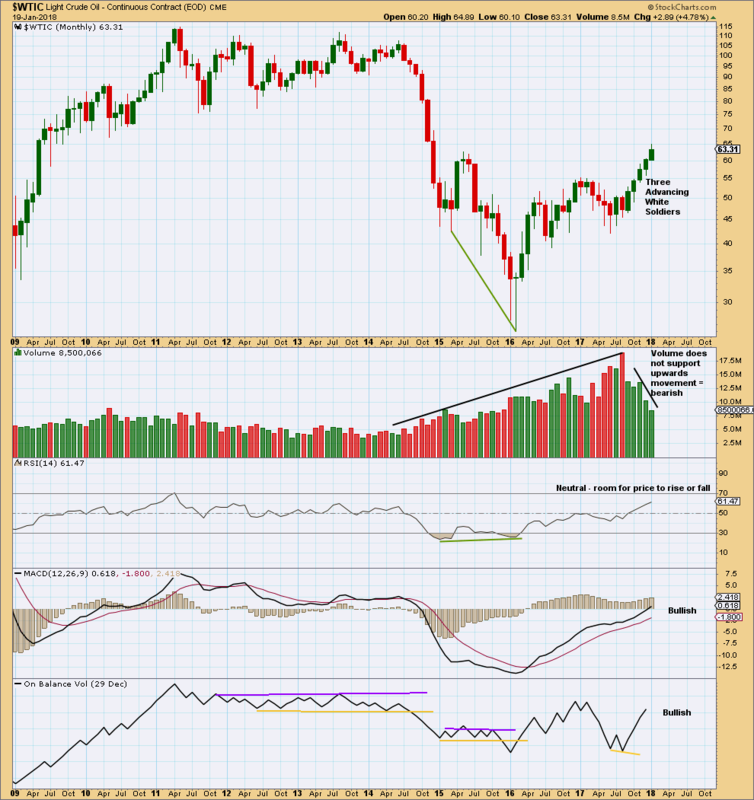 Bullish trends may remain extreme for reasonable periods of time, particularly for commodities. This chart remains bullish. Price moved higher for three sessions in a row to the last high, but this did not come with a normal corresponding decline in volatility. Volatility has increased for those three sessions. 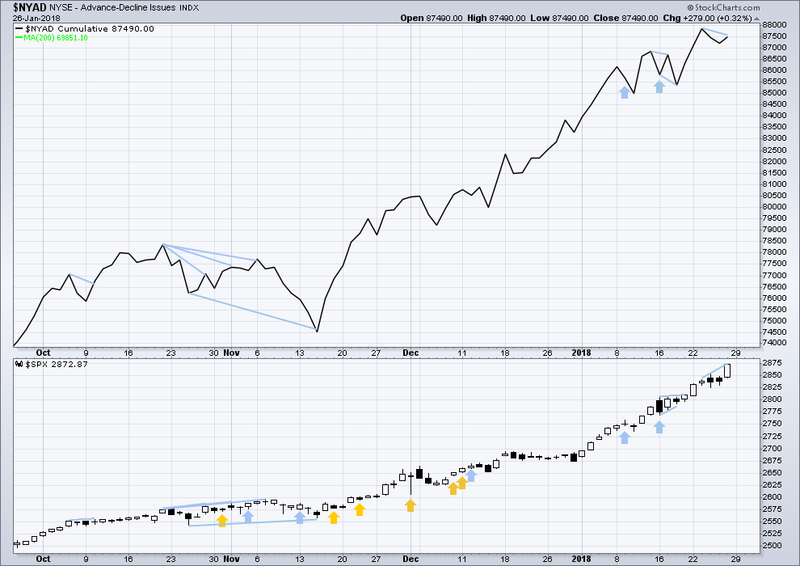 This divergence is interpreted as bearish. Published @ 11:27 p.m. EST on 27th January, 2018.